Another day that is forecast for fine weather with a E/NE winds that will pick up as the day goes on so I had a slightly earlier start on the river today. It was 9:25 am when I first stepped into the Mersey River to wet a Mepps spinner and maybe, just maybe get into a few trout. The conditions were perfect as was the river level, though it wasn't as clear as what I thought it would have been. Still good enough to fish, see the lure & even fish in it and that's all that mattered. This trip I started off using a Mepps #1 Aglia TW Streamer gold blade lure just for something different, hopefully it will be the lure that will do the job today in picking up a few trout. I have used it here before and caught a small brown on it, that day the fishing was very tough going so I had to make a change of lure. Today I started out using it in a headwater where a back water entered the river & never had a single touch or follow from a fish. 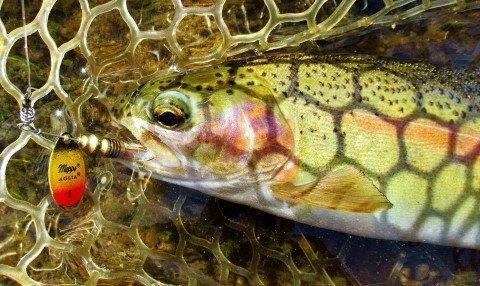 From there I moved into a large back water and fished my way upstream for close on fifty meters, all I could manage was a few follows from non aggressive trout. 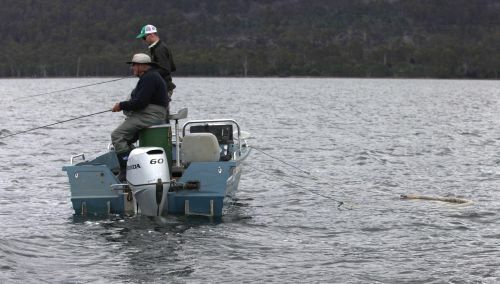 In accordance with the Tasmanian Inland Recreational Fishery Management Plan 2018-28, two fishery assessments have been identified for 2018-19, Woods Lake and Bronte Lagoon. We also plan to undertake a follow up survey of Shannon Lagoon following the release of 500- tagged fish in June 2017. After checking the BOM river heights I saw that the Meander River had dropped 50mms since my last disastrous trip there with just the one trout being caught. I thought with it being lower plus the air and water temp on the rise it was worth another visit. My only worry was the East/North/East winds that were forecast for most of the week, not a good wind direction for fishing. It's okay if it's just a very light breeze but once it picks up one may as well head for home. Today's weather conditions were ideal with it being a dull cool to mild overcast day & the lightest of an Easterly breeze. Being so overcast I didn't hit the river until around 10:00 am and commenced casting the Mepps Aglia Furia around in the clear cool flowing water. It was quite nice to finally be fishing the river at the perfect wading height for a change..
Don't get caught out! 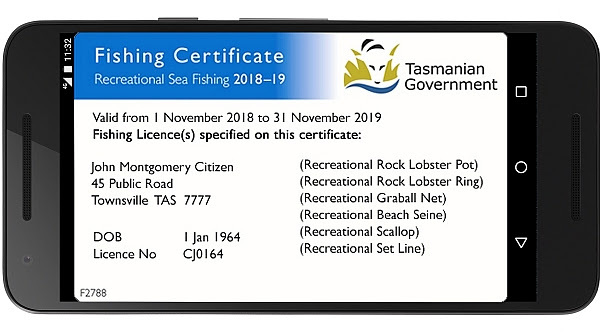 Recreational sea fishing licences for rock lobster, abalone, scallops, nets and set lines are now on sale online and at Service Tasmania. 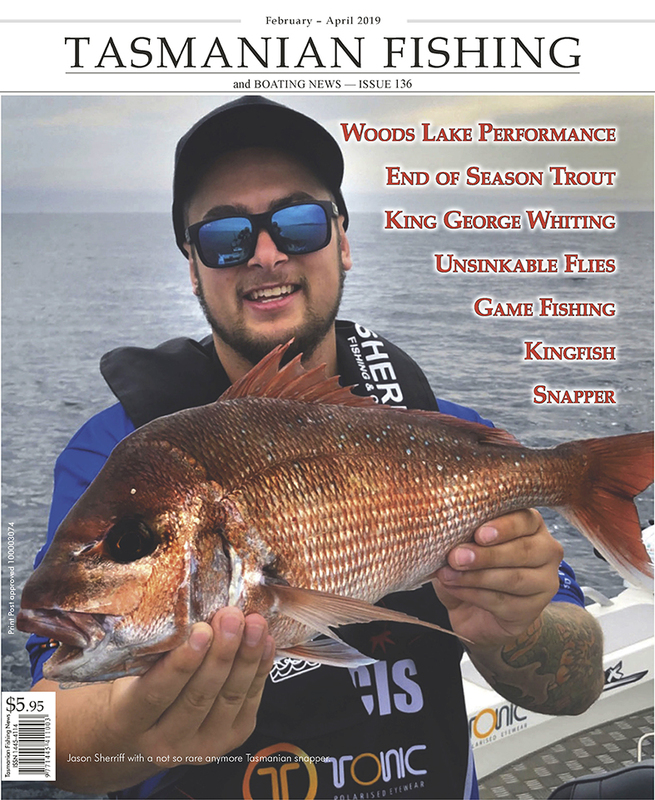 A reminder to recreational fishers that you cannot possess pots, rings or rock lobster in any part of the East Coast Stock Rebuilding Zone (ECSRZ) during the closed season for that area. This includes the D'Entrecasteaux Channel, and waters between St Helens and Eddystone Point - see maps below for boundaries. The ECSRZ boundary line at Eddystone Point is through the lighthouse at 40° 59' 35" S.
During 23-25 July 2018, the Service undertook a trapping survey within South Riana Dam. The purpose of the survey was to gain information on:. the brown trout population size. Before the survey, to help estimate the population, 400 adult brown trout, sourced from the Liawenee Canal spawning trap were adipose fin clipped and transferred to South Riana Dam. These fish weighed an average of 850 grams. 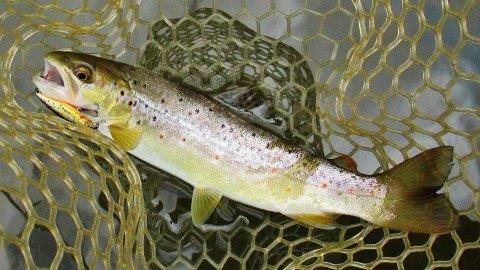 During the survey, 54 box traps were set over two nights with 115 brown trout captured. This equals 2.13 brown trout per trap. This indicates moderate to low abundance of brown trout. 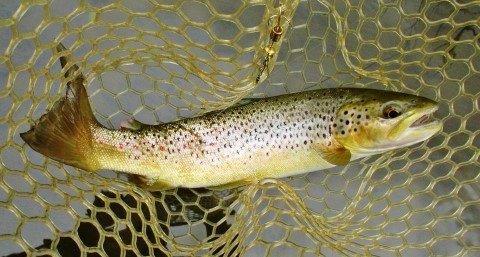 We examined the brown trout for the presence of an adipose fin clip with just two clipped fish captured. One individual freshwater crayfish (Astacopsis gouldi) was also captured. Over two nights, we set 104 box traps and captured 482 brown trout, with all areas of the lagoon surveyed. We weighed and measured 362 brown trout for fork length, with the remaining 120 brown trout counted only. 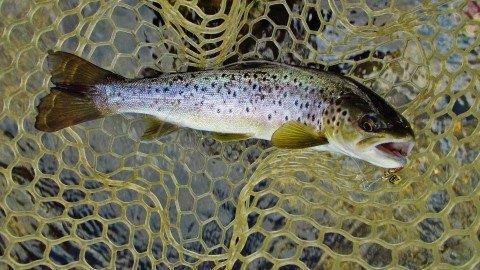 The CPUE for brown trout was 4.64 fish per trap, indicative of a high abundance of fish. A short video from Adrian Webb. Seeing as the Meander River level had dropped to 62 cms on the BOM river levels chart I thought it was worth heading there to see if the trout are out and about. The previous two trips here when the river was running at 77 cms to 80 cms weren't all that flash with just one brown being caught on the first trip and four on the second. Today I'm fishing a different stretch of river, so I'm hoping for a few trout to be around seeing as the day is warm and the water temp should be around 10-11 degrees which is 6-7 degrees better to what it was.. No sooner had I arrived when the wind picked up and started blowing a gale, this wasn't forecast for later in the afternoon (3:00pm) not at 10:00 am. It's been a week since my last trip to a river due to crappy weather & high river levels & I was over due for a spin session in a river. Today was one of our better days with mainly clear blue skies and a West - Nth Westerly breeze blowing, so it was good enough to go & wet a Mepps spinner. Firstly I went & checked out a small river near home only to find that there had been a lot of cattle in the river. Walked along it for around a kilometre without spotting a single trout, so I headed back to the car to try another river. So I headed on over to the Mersey River to find it was still running a little high and for some reason or another it wasn't all that clear either. During 23-25 July 2018, we undertook a trapping survey within the Pet Reservoir.  an estimate of the brown trout population size.